The house has been modernised and improved by the present owners. The roof was replaced in 2007 and the wiring was overhauled in 2002. There is a traditional Farmhouse kitchen with fireplace, plenty of exposed beams and stone walls. Viewing is recommended. 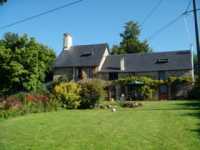 The property is located on the Manche/Orne border in the Normandy region of France between the villages of Beauchêne and Ger. The closest airport is Deauville Airport (99 km) also within reach are Dinard Airport (100 km), Rennes Airport (101 km), or Angers Airport (128 km). The UNESCO Heritage site of Mont St Michel is 58 km away and the coast at Granville is about 1 1/2 hours’ drive. It is about 25 minutes to a 9 hole golf course Golf De Bagnoles – Route de Domfront at Bagnoles sur Orne. The ferry ports are within easy reach – 1 hour to Caen Ouistreham, 4 1/2 hours to Calais, 2 1/2 hours to Le Harvre port or Cherbourg. It is about 2 hours 15 mins to Paris by train. The pretty village of Lonlay l’Abbaye is about 6 km away. More extensive facilities can be found in the historic town of Domfront, which is a 15 minute drive and the town of Flers with a swimming pool, bowling, restaurants, shops and schools (about 10 minutes drive) or Vire (15 minutes drive). Kitchen/Breakfast Room 5.48 x 5.26m Partly glazed stable door and window to front elevation. Tiled floor. 2 radiators. Exposed stone walls. Granite open fireplace with raised hearth. Exposed beams. Electrics. Tiled and solid wood worktop/breakfast bar. Space for range style cooker. Tiled splash back. Double ceramic sink with mixer tap. Space and plumbing for dishwasher. Fitted shelves. Telephone socket. Dining Room 5.78 x 4.63m 3 radiators. Wood-burner. Tiled floor. Stairs to first floor. Exposed stone walls. Window and 2 partly glazed stable doors to front elevation. Lounge 5.83 x 5.87m Window and partly glazed stable door to front and window to rear elevations. Wood-burner. Exposed stone walls. Tiled floor.2 radiators. Exposed beams. Utility Room 4.37 x 4.33m Door to front elevation. Tiled floor. Hot water cylinder. Boiler. Ceramic sink with mixer tap. Worktop. Space and plumbing for washing machine. Cloakroom Window to front elevation. Tiled floor and walls. Vent. WC. Mezzanine Study Area Exposed stone walls. Shelves. Laminate flooring. Landing Laminate flooring. Built-in cupboard. Stairs to second floor. Cloakroom Tiled floor and walls. WC. Window to front elevation. Bathroom 3.71 x 1.91m Window to front elevation. Vanity unit. Bath with mixer tap/shower fitment and tiled surround. Shower. Heated towel rail. Built-in shelves. Bedroom 1 3.57 x 3.28m Laminate flooring. Window to rear elevation. Radiator. Built-in self and wardrobe. Master Bedroom 6.16 x 4.38m Exposed stone wall. Sloping ceiling. Velux window to front and rear elevations. Laminate flooring. 2 radiators. Bedroom 3 4.80 x 3.47m Velux window to front elevation. Exposed stone wall and “A” frame. Radiator. Laminate flooring. A 5 bar gate leads to driveway. Large patio. The garden is laid to lawn. Well. Outside lean-to shed for oil storage tank. Detached block Workshop 4.00 x 3.00m Window to front and door to rear elevations. Concrete floor. Power and light. Separate Detached Stone House 5.00 x 4.00m (potential small Gite) Corrugated iron and Fibro-cement roof. First floor over for storage. Mains water, telephone and electricity are connected. Drainage to an all water septic tank. Oil fired central heating. Broadband internet connection. Please note : There is no energy rating for this property because the Vendors do not have the last 3 years’ energy bills.